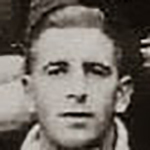 Peter had spent some time playing in Italy and had been with Forfar Athletic, Falkirk, King’s Park and Raith Rovers before he joined United at the end of season 1939-40. Of Italian descent, Peter was born in Dundee and had come through school football before joining Dundee Osbourne Juniors in the 1920s. He signed professionally for Dundee in 1930 but failed to make an impression and later joined Forfar. It was while he was with Forfar that he would also spend some time playing in Italy, notable turning out for Borgotaro, Genoa & Ambrosiana Milano (the latter now known as Internazionale). He was called up for national service in 1941 and during the Second World War he turned out a handful of times for United. He signed for United again in September 1945 but was released at the end of the season, going on to sign for Montrose thereafter. His son, also named Peter, became an associate director at United and in 2009 was elected chairman of the club's Centenary Committee. Peter was born on this date in Dundee.